Everton fell again this time at Goodison Park against Liverpool, in the Yesterday's Super Monday Merseyside Derby. It was non but the last minutes of the game that made the difference. Klopp Side now second on the premier League Table with 37 points, six behind the leaders Chelsea. A draw in this game would have delayed their title dreams or even put them off as title contenders. Liverpool control the game at some point but the game was mostly leveled as both sides ensured the other had no fruitfulness in their half. The first 45, Liverpool witnessed the speed of Everton, the very fast pace placed Liverpool off their game but by the second 45. 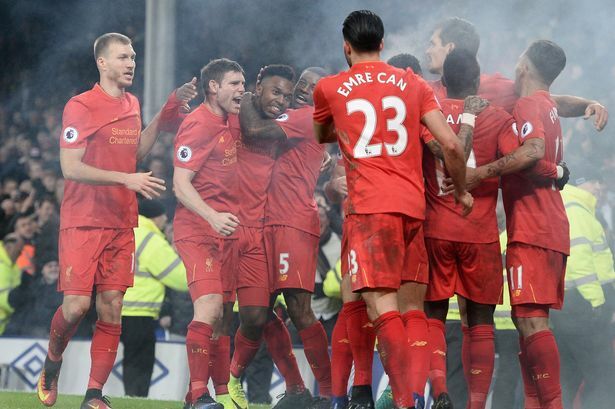 Everton has just won only a game in 20, also lost their home unbeaten record, lost all three points and all this happened in the last minutes when the substitute Daniel Sturidge's great shot hit the pole and Sadio Mane stole away their victory. Klopp seem to have solved Liverpool defensive issues and was able to close all loop holes rendering Lukaku useless in the Liverpool defense. Everton will face Leicester away on boxing Day action while Liverpool meets Stoke City the next day.